There are people — Americans! — who are currently attempting to vote for President. Unfortunately, the lines are DMV long, there aren't enough voting machines in Ohio (thanks, John Husted, ya jagoff! ), and it's very cold and boring to stand in line. To remedy this and keep people's spirits up, why not send those on the front lines of democracy/the edge of their sanity a hot, delicious pizza? WHAT A LOVELY IDEA! Cowabunga, says my overtired, under-rested brain. Pizza to the Polls is a Tumblr that contains a map of polling stations in Pennsylvania, along with information on nearby pizzerias. Kind of reminds me of that "send pizza to Wisconsin protesters" microtrend from 2011. But just because Pizza to the Polls only features Pennsylvania voting locations so far doesn't mean you can't send pizza to other voters waiting in long lines. There's also been reports of 5+ hour wait times in Virginia and snafus in Ohio. And if you had to wait a long time to vote at your designated location, do a kindness to the people who were behind you in line and send 'em a pizza. Master Shredder will be most pleased. 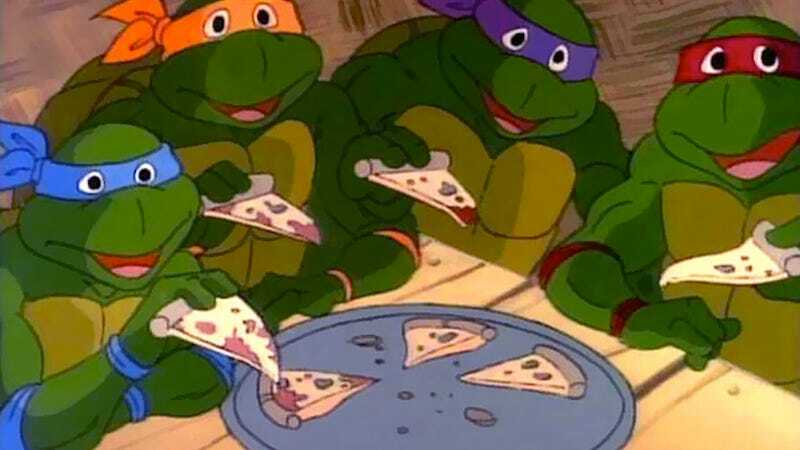 Speaking of pizza and delirium, did anyone else pick out one of the Teenage Mutant Ninja Turtles and declare him your "boyfriend" when you were in first grade? No? Okay.